Let’s see… where did I leave off? Ah yes… over the last 10 day Ben and I have trekked 141 kilometers and climbed about 6,500 meters to arrive at High Camp, which is the last place one can over night prior to going over the Thorung La Pass (which, at 5,416 meters / 17,760 feet up in altitude, is the highest point in the Annapurna Circuit trek). 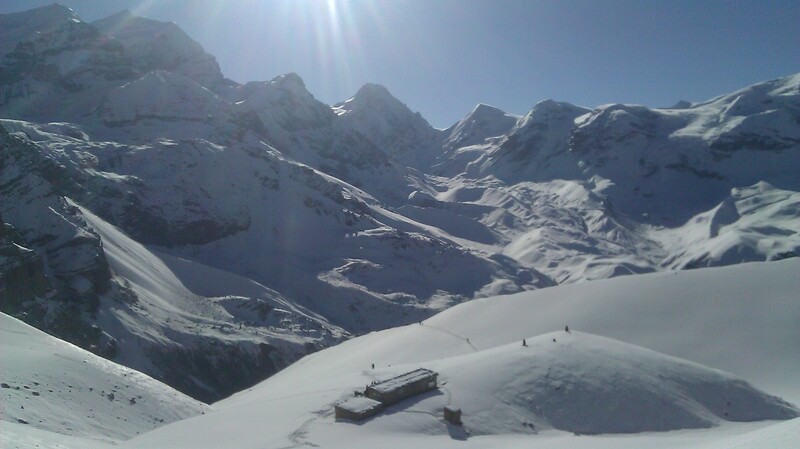 Now, I think I mentioned this in the previous post, but there’s actually one other place one can overnight before attempting the pass, Thorung Phedi, which is about 480 meters / 1,575 feet below High Camp. The problem is that the climb from one to the other is pretty much switchbacks straight up the mountain on a snow-covered trail. Ben and I did not want to tackle that climb first thing in the morning (not to mention the remaining climb over the pass and the very long descent). Some people also choose to stay down at Thorung Phedi due to the potential for getting altitude sickness by climbing too high too fast at such an already high altitude (between Yak Kharka, where we spent the preceding night, and High Camp, we climbed 910 meters / 3,000 feet, which is a lot for one day). But the thought of that climb first thing in the morning outweighed the potential danger of altitude sickness (neither Ben nor I had any problems up until this point) so we decided to roll the dice and stay at High Camp. A view back down the climb from about halfway up… yes, that’s a tea shop. One thing that I found interesting was that High Camp was packed… you see, a snow storm had been dumping snow for the previous three days before the day we reached High Camp, so there as a backlog of folks wanting to go over the pass but waiting for better weather (I think, with the right equipment, it would be possible to cross the pass in a snow storm, but not advisable… I’m sure some people did it anyways). Ben and I arrived at high camp around noon and managed to get the last available double room (thank you impeccable timing). The weather was actually bright and sunny until the afternoon clouds rolled in, so, despite the crowding (and the logistical problems the large crowd caused… only two bathrooms for about 250 people and a small kitchen for that many hungry trekkers), the whole place had an atmosphere of good cheer. Ben and I spent the afternoon catching up with some folks wed met earlier on the trek, napping a bit and playing cards. Per our usual routine, we were some of the last people to eat dinner and part of the last group of folks to leave the dining hall to retire to our rooms (at around 8:30 PM… trekkers do not seem to be night owls). We read a bit then turned in at around 10 PM for a very, very cold night (I have no idea what the temperature, but it was definitely below freezing… and it gets pretty cold in rooms with no power or heating). Now before we had gone to bed, we asked around to see when everyone was planning on leaving… the universal answer being a wake-up call at 4 or 4:30 AM and hitting the trail within 30 or 45 minutes thereafter. Hellz no… I really don’t get these people… it is very, very cold before the sun gets high enough to heat things up a bit (which is generally around 8 AM or so)… why start walking so early (it’s not like these folks are super-slow walkers either)? As with any amount of groupthink, we almost succumbed to the pressure, but once we discussed it back in the room we decided that there was no way we were going to get up early. We did, however, set the alarm for 6 AM, and we had ordered and packed food the previous night so we could be out the door by 6:30 AM (which would prove to be, by far and away, the earliest we’d ever been out the door to trek… we generally weren’t even awake by that time… alright I wasn’t, Ben seemed to wake up earlier than me on most days). All went as planned and were up at 6 and out the door by 6:30… as we thought, High Camp was a ghost town… everyone was gone before we even woke up I think (I couldn’t see anyone, or any tell tale signs of people remaining, when I went to brush my teeth at 6:15ish)… there were even people completing the climb from Thorung Phedi below passing High Camp at that time. So we continued our tradition of being either the last, or at least the second to last, people out of the lodge each morning. Luckily for us and everyone else crossing the pass that day, the weather was beautiful… crystal clear and sunny (and again, not too cold once the sun got up). From the snow storm over the previous couple of days, the whole pass was covered with a blanket of nice white snow. And (another benefit of not being the first people out the door) the trail was clearly marked from so many people having already walked it (a problem we’d found on other days being out by ourselves while it was snowing). Now the climb from High Camp up to Thorung La Pass still takes awhile as you have to ascend 490 meters (1,600 feet), but it’s nowhere near as steep as the section before High Camp. However…. It’s still pretty hard just from the altitude alone. It took us about 2 and a half hours to make the pass… Ben was feeling a bit nauseous on the way up (from the altitude) and had to sit for a spell on occasion (he was fine by the time he reached the pass). We spent a good twenty minutes at the top, taking pictures, eating celebratory candy bars, admiring the view and chatting with everyone we knew. The feeling and the views were great, but we both knew it was a long, long way down. Day 1: Besishahar (760 mts elevation) to Bahundada – 18 kms. +550 mts ascent. Day 2: Bahundada to Tal – 17 kms. 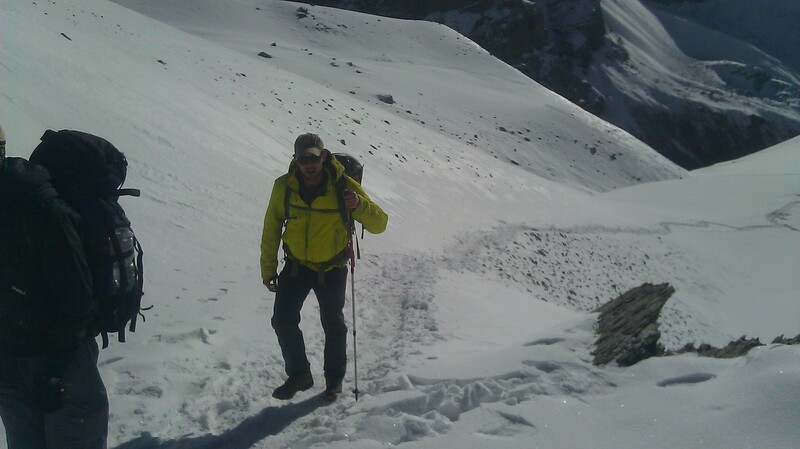 -210 mts descent, +600 mts ascent. 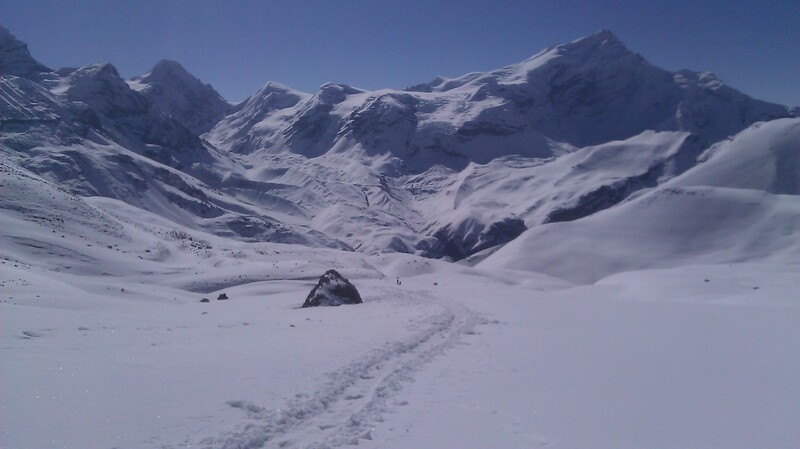 Day 4: Chame to Upper Pisang – 13 kms. +630 mts ascent. 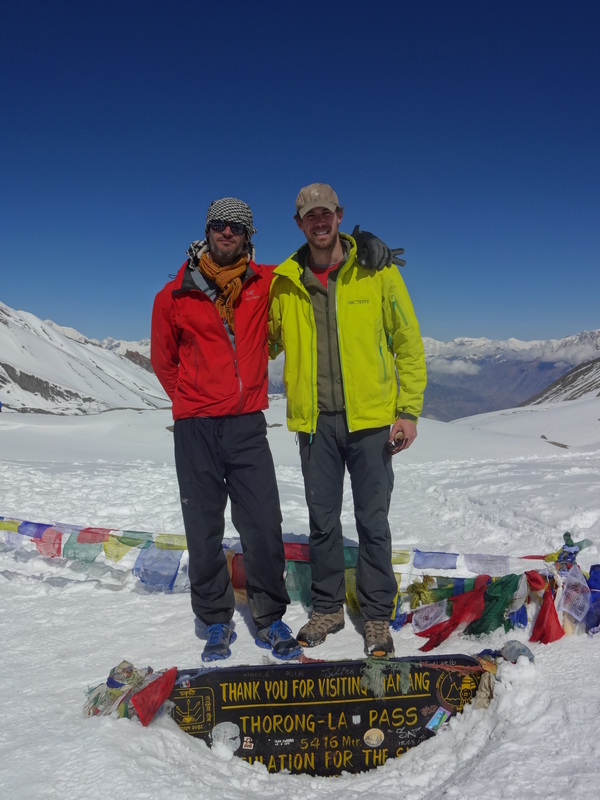 Day 5: Upper Pisang to Bharka – 17 kms. +370 mts ascent, -310 mts descent. Day 6: Bharka to Bharka (via ice lakes) – 12 kms. +/- 1,200 mts ascent/descent. Day 7: Bharka to Tilicho Base Camp – 11 kms. +790 mts ascent. 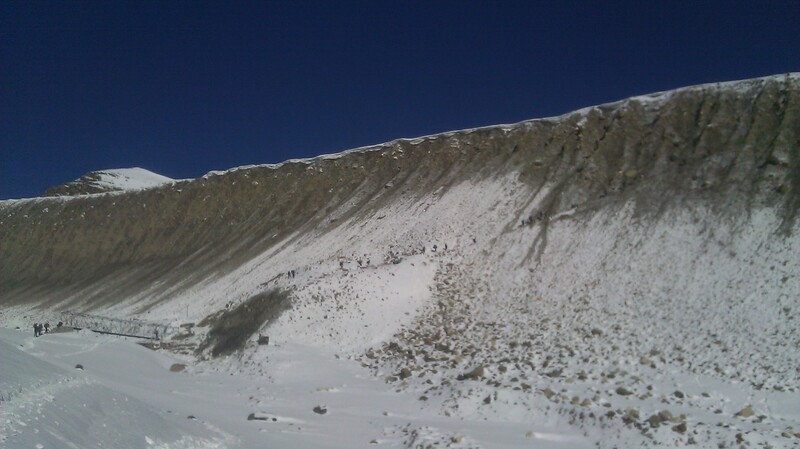 Day 8: Tilicho Base Camp to Khangsar – 8 kms. -420 mts descent. Day 9: Khangsar to Yak Kharka – 15 kms. -190 mts descent, +480 mts ascent. 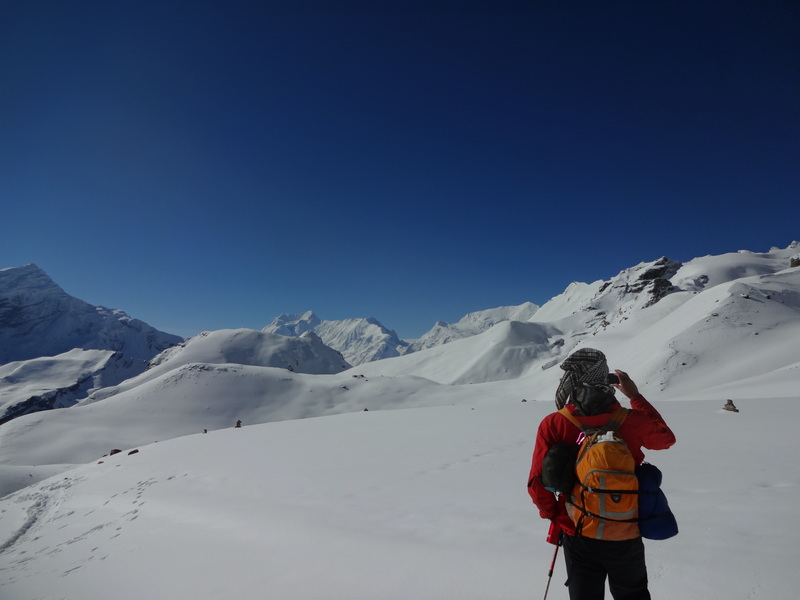 Day 10: Yak Kharka to High Camp – 8 kms. +910 mts ascent. 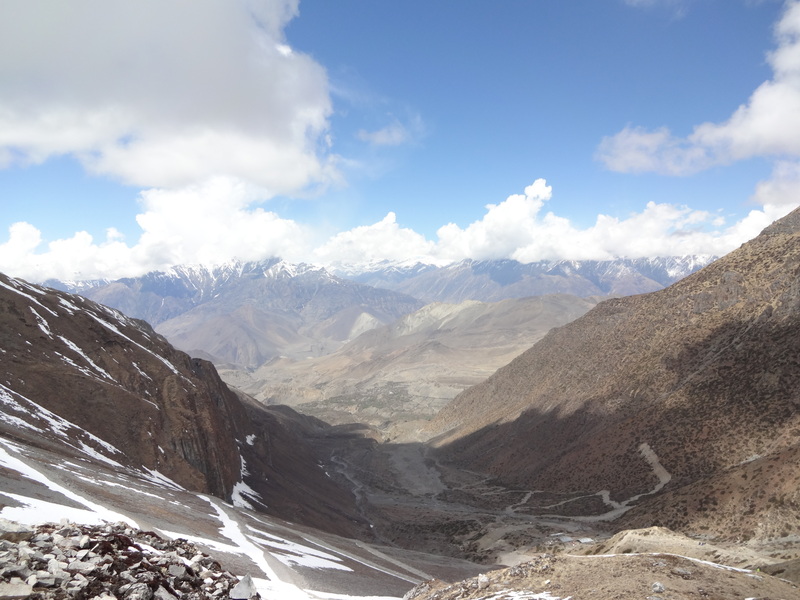 Day 11: HC to Muktinath via Thorung La – 13 kms. +490 mts ascent, -1,660 mts. descent. Totals: 11 days, 154 kilometers (95 miles) and about 6,990 meters of ascending (that’s about 22,930 feet, or 4.3 miles of climbing). 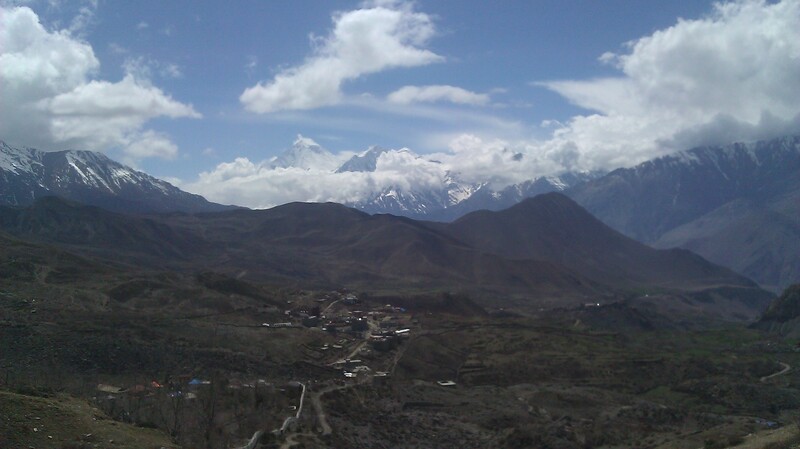 Muktinath was a lively as I’ve seen a place full of trekkers. Hotel Bob Marley (yes… really) actually had a nicely laid out restaurant with good pizza and really good music. Ben and I downed a couple of pizzas and several pints of the local apple brandy, chatted with some more folks we knew and made a real late night of it, turning in at 11 and looking forward to not walking the next day. 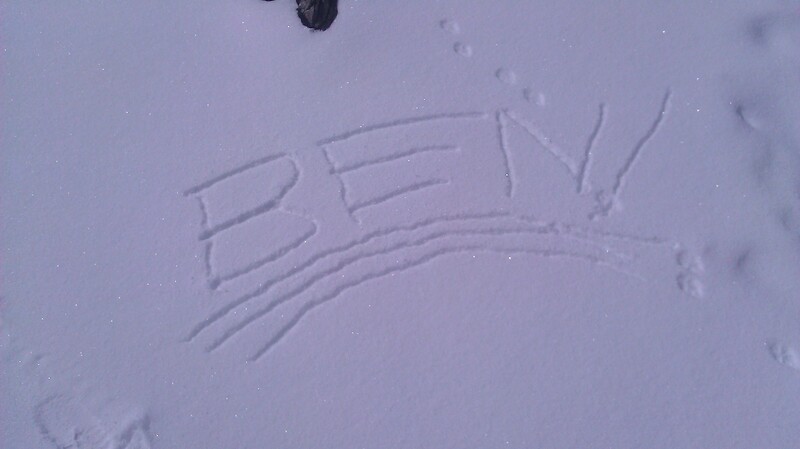 This entry was posted in Nepal by Richard. Bookmark the permalink. Bravo for you two. What an incredible adventure. Love the read……..
Spot on… I think it was the clay in the area… so the whole bottom of the river was an almost white shade of grey, and when the sun got on it the water was amazing. As we went higher the color went away.